We have to do something about a dolly. The thing is that with those cheap-o dollys you can't really ride them and it's almost impossible to do a decent pan while also dollying (when you're operating the camera and the dolly.) The pans invariably get jerky and it's really annoying. A decent geared head will cost at a minimum $5000 used (and weigh upwards of 100 pounds). 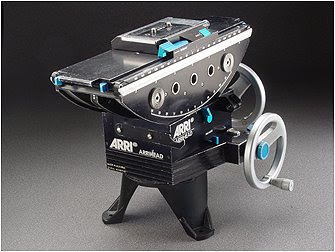 The Arri will cost $15K and weigh 35 pounds. So you'll need a big fat tripod and/or dolly for it to ride on. So really you're going to need a grip to handle it. And, of course, you're going to need an AC to pull focus because the operator won't have a hand free. But my big problem with our current setup is that although we can move the camera sideways, it's really hard to move in to the subject. That's because of the focus pulling. So although this is the "grip" edition of the post-mortem, we're really talking about focus pulling (again). Maybe on some days we rent a grip truck with a Key Grip and use his dolly? In any case, we need an AC. Go ahead. Click on the ad all you want. It just gets better.